The Fleur de Lys Door Knocker is sand-cast in solid broze and finished with a patina process to give it a rich antique finish. The oiled bronze finish is attained by successively dipping raw bronze castings into a patina solution and then buffing them to a satin finish. With the repetition of this process Michael creates the rich, dark multi-tone finish of his Oiled Bronze. 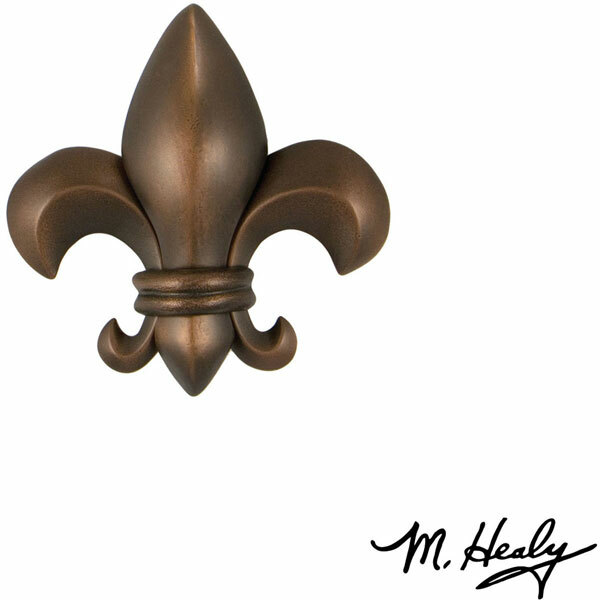 The Oiled Bronze Fleur de Lys Door Knocker was designed by Michael Healy, an accomplished Rhode Island artisan known for his truly unique Door Knockers. Contrary to popular belief, the Fleur de Lys did not originate in France, but rather was first popularized in ancient Rome. Michael, an avid history buff, was inspired to create this Fleur de Lys Door Knocker in the spirit of its original significance. The Fleur de Lys (derived from the Celtic word "li" or "lly" meaning king or ruler) is a symbol of power, life and purity and was first coined as the "flower of kings." What a uniquely elegant way to greet visitors.